The Flambeau Mine, located along the shores of the Flambeau River near Ladysmith, Wisconsin, operated from 1993 to 1997 and was reclaimed by 1999. As the first mine to earn permits and operate under Wisconsin’s stringent modern mining laws, the Flambeau Mine met the highest mining, exploration and reclamation standards. After a long history of exploration in the area, Kennecott Minerals Company, a wholly owned subsidiary of Rio Tinto, discovered the Flambeau ore body in 1968. The deposit was a relatively small, but exceptionally rich, ore body with a copper concentration of 10 percent. The deposit generated a total of 181,000 tons of copper, 334,000 ounces of gold, and 3.3 million ounces of silver. During construction and operations, 85 percent of the workforce included local residents, and more than 100,000 people visited the mining site. The Flambeau Mine is an example of Rio Tinto’s commitment to sustainable development, careful planning and modern day mining practices. 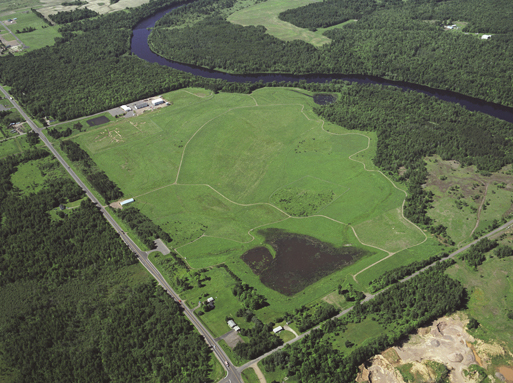 Today the 150-acre site is called the Reclaimed Flambeau Mine Nature Trails & Recreation Area. Following the $20 million reclamation project, the area now serves as a year-round community resource. The site is home to prairie and woodland habitat along with 10 acres of wetlands which support hundreds of plant and wildlife species. Visitors enjoy free access to ten miles of hiking trails and five miles of equestrian trails, as well as bird watching, fishing and a variety of other activities. As part of its ongoing commitment to the community, Rio Tinto continues to work with stakeholders to ensure that promises are kept and to protect the environment, provide services that benefit the local economy and maintain the site in its natural state.